The Daily Citizen. J.M. Swords ... Proprietor Vicksburg, Miss. 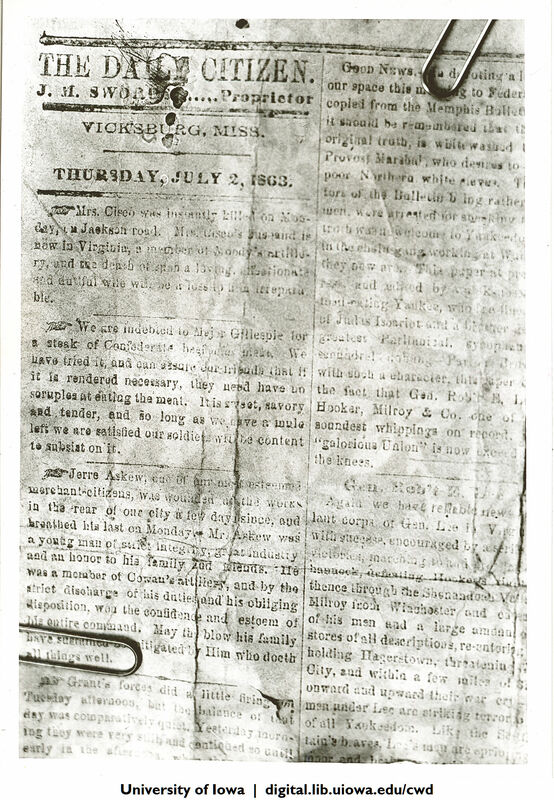 Thursday, July 2, 1863 Mrs. Cisco was instantly killed on Monday, on Jackson road. Mrs. Cisco's husband is now in Virginia, a member of Moody's artillery, and the death of such a loving, affectionate and dutiful wife will be a loss to him irreparable. We are indebted to Major Gillespie for a steak of Confederate beef [this week?]. We have tried it and can assure our friends that if it is rendered necessary, they need have no scruples at eating the meat. It is sweet, savory and tender, and so long as we have a mule left we are satisfied our soldiers will be content to subsist on it. Jerre Askew, one of our most esteemed merchant-citizens, was wounded on the works at the rear of our city a few days since, and breathed his last on Monday. Mr. Askew was a young man of strict integrity, great industry and an honor to his family and friends. He was a member of Cowan's artillery and by the strict discharge of his duties and his obliging disposition, won the confidence and esteem of his entire command. May the blow his family have sustained be mitigated by Him who doeth all things well. Mr. Grant's forces did a little firing on Tuesday afternoon, but the balance of that day was comparatively quiet. Yesterday morning they were very still, and continued so until early in the afternoon when [illegible].